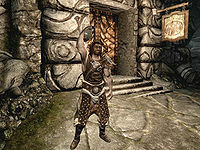 Yngvar the Singer is a Nord barbarian who lives in Markarth. He claims to be a brute, but is in fact a bard, educated at the Bards College in Solitude. As such, he will gladly provide help with Calcelmo's love problem during The Book of Love. He is appointed housecarl to Thongvor Silver-Blood should the Stormcloaks gain control of the city. Yngvar wears studded armor along with a pair of hide boots. He carries a key to the Treasury House and a selection of common loot and gold. In combat, he relies on a steel warhammer. Tyranus: "So you don't know anything about this house?" Tyranus: "Anyone seen entering or leaving? Any strange lights or unusual noises?" Yngvar: "It's abandoned and it's always been abandoned." 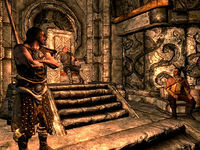 Yngvar will then leave the Vigilant of Stendarr alone, while shaking his head: "Don't know what that man expects. House is empty." He is clearly a brute, and when you run into him he will just look at you and say: "Outsiders. Pfft." He will then start to warn you about the city: "Blood and silver, friend. Blood and silver." and "Just turn around and leave the city. That's the smart move." When you talk to him he will ask: "Bloody enough for you, outsider?" Three options are available at this point. If you say 'Excuse me?' he will repeat: "Markarth. Is it bloody enough for you?" At this point you can ask him if he is threatening you, to which he will make clear: "If I was threatening you, believe me, you'd know it. You outsiders never learn. If the Forsworn don't get you, the guards will throw you in Cidhna Mine to work your fingers off. Think that's water in the river? Blood and silver are what flows through Markarth, friend." If you instead say 'Bloody enough' he will respond: "Then turn around and go back where you came. City doesn't need you, doesn't want you. Blood and silver are what flows through Markarth. That's the way it is. That's the way it'll stay." If you choose the third option, 'More blood is always better', he will tell you you're in the right place: "Then you've found your home, friend. Blood and silver are what flows through Markarth. Welcome." He will then readily elaborate on the city, starting with what he means by 'blood and silver': "It's right there in the name of the most powerful family in Markarth. The Silver-Bloods. They have a whole mine filled with prisoners to dig up silver ore, gets smelted by workers they pay, and they own half the city. I work for them. The inn is named after them. When the guards make an arrest, they check with them first." 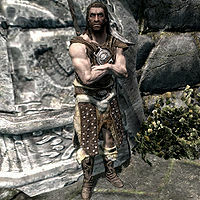 If you ask him for work he will point you to the jarl: "Jarl is who you want to talk to. Always coin to be made killing off some Forsworn in the hills. As long as you don't mind going axe-to-axe with a bunch of Daedra-worshipping savages who practice the dark arts." Lastly, you can ask if he lives in Markarth, and he will respond: "No. I live in a nice house in Solitude where the air isn't filled with smoke from the silver smelters and golden-haired girls shine my shield. Been here ever since I left the Bards College. Turns out a few muscles earn more gold than a damn lute. The Silver-Bloods pay me, let me crack a few skulls, and keep the guards off my back. That's all I need." "Ha! About time we got some more muscle in this city." Thongvor: "I want word on our campaign against the Imperials." Reburrus: "I have a few very detailed missives from border patrols, beginning with Fifth Irregulars' reports on the movements of...."
Yngvar: "Oh, Talos's breath, Reberrus [sic]. Skip ahead to the good part." Reburrus: "Oh, right. Oh, well, things are going well enough. At least, as well as we can hope." Thongvor: "What does that mean Reberrus [sic]? Are we winning or aren't we?" Reburrus: "I, uh, I can't tell Thongvor. It's anyone's guess." Thongvor: "I see. Well, let's continue this discussion later then." Thongvor: "How goes the trade in and out of the city?" Reburrus: "Very well, Thongvor. With the Stormcloaks here to help, the Silver-Blood family control nearly every route in and out of the city." Yngvar: "Except the ones attacked by Forsworn." Reburrus: "Well yes, of course you had to go and mention that." Thongvor: "The Forsworn aren't our real concern, defeating the Imperials and making sure we keep control of this city is." Thongvor: "Reburrus, I need you to draft a letter to Ulfric requesting more men." Yngvar: "Ha! About time we got some more muscle in this city." Reburrus: "Thongvor, do you really think that's wise? I mean, King Ulfric is such a busy man, and there are so many areas of Skyrim to protect." Thongvor: "Whose side are you on, Reburrus? I'm not worried about Skyrim, I'm worried about the Reach. Specifically, the part of the Reach we're standing on." Reburrus: "Yes, Thongvor. I'll draft the letter immediately." During the quest The Book of Love, Dinya Balu asks you to fix a few broken hearts in Markarth. As it turns out, Understone Keep wizard Calcelmo is tired of his reclusive life and has cast his eyes on Faleen. Calcelmo's only problem is, he is no good with the ladies. Luckily, he knows someone who is: "There is one... Yngvar. He's quite popular with the ladies. Thankfully Faleen is not quite his type, but they've been friends for some time, and he may have some ideas. Please, ask him what she likes. It's my only chance." Locate Yngvar who will have a very good idea about what Faleen likes, although he will ask: "What? Why, are you... interested?" If you keep Calcelmo's identity a secret, he will respond: "Ah, a secret admirer, eh? Don't worry, I won't tell a soul." If you tell him it is Calcelmo, he will say: "Calcelmo? Is he interested in Faleen? That sly old codger. I should have guessed. Good for him. For the both of them. Between you and me, she could use a bit of warmth." He will then continue: "As for what she might like... I didn't tell you this. Faleen likes to act tough, but she really has a soft spot for, of all things, poetry. You know, I took some classes at the Bards College as a youth. Poems come in handy when wooing. There's a poem I once used on an older lady of Rorikstead. I can change it to be about Faleen, if you've got some gold. Are you prepared to receive my golden words?" If you lack the gold, he will instead say: "Hmmm. I don't think you've got enough to cover my expenses with Silver-Bloods, much less convince me give [sic] my words away." If you tell him 200 gold is too much, he will say: "Come back when you've got the gold, then." If you accept, he will say: "Wonderful. I'll write it out so you won't forget it. You should probably just take this directly to Faleen. Wouldn't want the old icebrain stumbling over the words." If you chose not to tell him about Calcelmo, he will say: "You should probably just let Faleen read it herself. Don't want you stumbling over the words and ruining my flow." He will then hand you his love poem showing that Yngvar is, in fact, not just a brute. Kleppr: "Ah, Yngvar, here to sing? You know an employee of the Silver-Blood family is always a guest of honor here." Yngvar: "Shut it, Kleppr. Thongvor isn't here, so save your kissing up for a Nord who cares." Kleppr: "Always such a model for decency in these troubled times, Yngvar." This page was last modified on 6 March 2018, at 04:06.